This week the IWA is supporting actions against the international polling company TNS and its major clients in response to its firing of a CNT union delegate in Spain and its refusal to speak with the union. The sections of the International will be letting the companies involved know of their disapproval of TNS actions all week long. TNS is a multinational market research and market information company, with offices in 19 countries in Asia and 37 countries in Europe etc. Over the past 2 years in Spain, TNS has been introducing worse and worse working conditions, making the work mroe precarious, eliminating bonuses, making people work 12 hour days (against the law) and making people work in really tight spaces. During an 8 hour day, the pollster receives two 5-minute breaks of break and one 20 minute break – the situation over 12 hours is even worse. The CNT delegate had worked in TNS for 5 years before he was dismissed in November 2013. He had been protesting the worsening work conditions. The comrades at CNT see this as a union-busing action, to get rid of a worker who was organizing in the workplace and fighting for the workers' rights. Over the last few months, the CNT has been protesting the dismissal by picketing not only TNS, but also its makor clients such as Volkswagen. The IWA shows its support for the actions of the comrades in Spain and we will join in demanding the reinstatement of the union delegate in TNS. The day of action called by the International Workers Association on March 6th finishes with dozens of protest actions in 13 different countries. CNT and IWA demand the reinstatement of the worker dismissed from Isban and Panel Sistemas because of denouncing the trafficking of staff. IWA anarchist worker unions showed, once again, that working class solidarity has no borders. Thousands of leaflets were distributed around the world, hundreds of posters and stickers were stuck, hundreds of protest faxes and e-mails were sent, dozens of branches of the Bank were visited, numerous pickets were organized, banners informing of the conflict were hung and other boycott actions were carried out. Solidarity Federation (SolFed) did several actions in England in places like Brighton and Newcastle. In Argentina, FORA (Federation Obrera Regional Argentina) organized a concentration in Neuquén Capital. 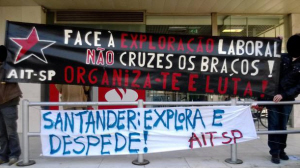 AIT-Secção Portuguesa (IWA portuguese section) did pickets in Lisbon and Porto. 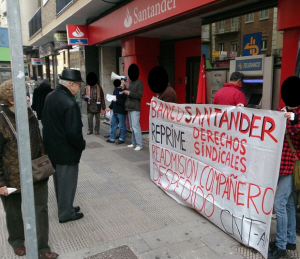 Polish ZSP (Zwiazek Syndykalistow Polski) picketed at the doors of Santander Bank central offices in Varsaw. Confederação Operária Brasileira (COB) carried out picketing in Brasil in cities like Araxa. OHL – Reinstatement for Angel NOW! 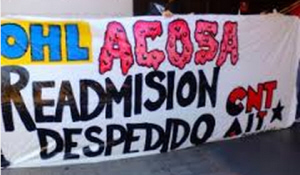 The IWA expresses it continued support of the actions to reinstate Angel, dismissed from OHL company in Madrid. He had worked in the company for over 10 years without problems but OHL, one of 4 companies which cleans the streets of Madrid, dismissed him and others. The CNT has been struggling for the comrade's reinstatement and we send our solidarity and will renew actions at OHL offices in different countries where the IWA is present. 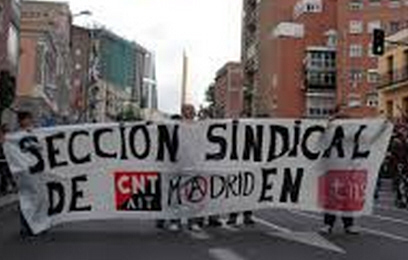 "A few weeks after Angel was sacked, Madrid cleaning services begin a strike against the legal threat announced by OHL and the rest of subcontractors of firing 1400 workers and reducing salaries for the rest by about 40%. An agreement which was really negative for workers was signed by the bureaucratic unions CCOO, UGT and CGT, with 45 days suspended job and salary, a wage freeze for the next 4 years, and destruction of jobs that open up when workers retire. The unions and company also condemned the 350 workers already sacked. We want to show Villar Mir, the owner of OHL, the rich ones that oppress and fire, and the politicians here in Madrid, Ana Botella and all her tribe of thieves, who knew the new subcontractors were going to sack a lot of workers, that this conflict is just beginning." Read more about OHL – Reinstatement for Angel NOW! On the 9th of October , the company OHL, one of 4 responsible for the cleaning service of the streets in Madrid, decided to fire our comrade Ángel, who had worked at this job for more than 10 years without any problems. The firing came after tensions when the companies that provide cleaning services planned mass dismissals. The CNT, which fights against dismissals, could not accept this and is fighting for the reinstatement of the comrade. 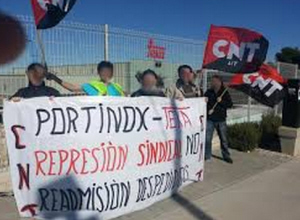 Several pickets have been held in Spain to demand the reinstatement of the comrade. Some Sections of the IWA where OHL is present also supported this struggle by making solidarity actions at OHL's foreign offices. Priama akcia visited the office in Bratislava, delivering a protest and declaring its solidarity. ZSP did the same in Warsaw and in Wroclaw. More actions are planned against the company which, despite having good profits, dismisses workers. 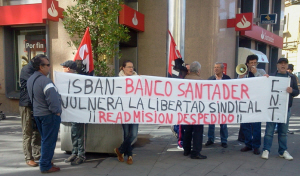 The past Thursday, December 12, the Santander Bank, Isban and Panel Systems had to face an impressive mobilization of workers united amongst equals. The Sections of the International Workers' Association, the anarchosyndicalist international, supported the call for solidarity from the workers in conflict. Dozens of actions took place against the stupified companies which are complicit in the trafficking of the workforce. Overcoming the absurd frontiers that divide the planet, the message of the Isban workers in struggle was distributed in 12 different languages (Spanish, Catalan, Basque, Galician, English, Chinese, Russian, French, Portuguese, Polish, Norweigan and Slovak).